This feature also opens the door to some unique sample prep techniques. One question we get all the time is “Can I just make one stock and have the Atomx make my calibration?” Well, it depends on your compounds and the dynamic range of the calibration. We have done some successful applications using shorter compound lists, but there are some things to consider before jumping in with both feet. For a large portion of the VOC list, especially those that are nonpolar and exhibit lower vapor pressures, serial dilutions of a high standard will produce an acceptable calibration curve. 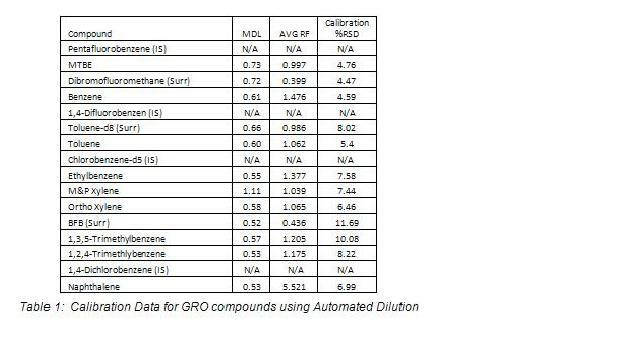 We do have applications available for limited compound lists using calibration by dilution. 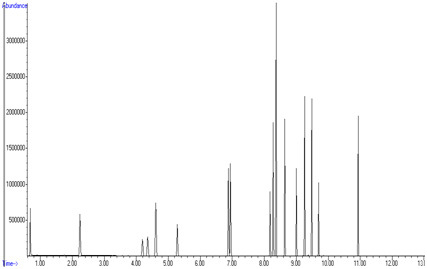 Figure 1 shows an example of a chromatogram of a standard made using automated dilution and Table 1 shows calibration data for a GRO compound list using automated calibration. There are also limitations on the dilution capacity. If your calibration range covers more than 2 orders of magnitude, you will need to make up more than one stock standard, due to the maximum dilution on the Atomx (1:100). This can be sufficient for most drinking water methods, but not the standard wastewater methods. Normal 8260 calibrations run from 0.5ppb to 200ppb which would require a 400x dilution of the highest standard or, in this case, using 2 higher level stocks to cover the range. Polar compounds can also be tricky because they partition in and out of water at different rates than nonpolar compounds. This can be seen in the disparity of purge efficiencies when switching from 5mL to 25mL sample sizes. This relationship is also not necessarily linear across a normal dilution scheme without significant method optimization. So, automated calibration by dilution is plausible, but you have to do your homework. A shorter, nonpolar compound list will give the greatest chance of success, but any additions will need further evaluation and method optimization to provide linear calibrations.